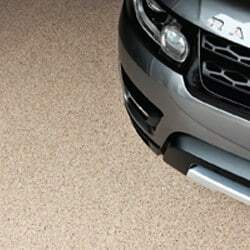 GarageFloorCoating.com Announces Revolutionary “Clean” Mica and its New Bagari Stone Effects Coating System Phoenix, AZ, October 29, 2018- GarageFloorCoating.com (www.garagefloorcoating.com) is announcing its exclusive and proprietary “clean” mica and its new epoxy coating system called Bagari Stone Effects. Mica is a shimmering silicate mineral found as minute crystals in granite and other rocks. It is available in several colors and opacities. When broadcast into epoxy coatings, mica crystals (or mica “chips”) provide a unique texture, pattern and contrast to flooring. However, the issue with standard mica is that the chips are very light (far lighter in weight than thermoplastic chips called polyvinyl acetate or PVA). While PVA chips are easy to broadcast, mica chips float in the air and cling to clothing, walls and other surfaces. As a result, incorporating standard mica into chipped coating systems increases labor costs by extending installation time and requiring extensive clean up. Cue GarageFloorCoating.com which has developed its proprietary “clean mica” that doesn’t float in the air…in fact it broadcasts just like PVA chips alone. Its use drastically cuts installation time, minimizes post-installation clean up, eliminates mica “razor blades” and permits fast chip reclamation before clear coating. In addition, this clean mica can permit one day installations…unheard of with standard mica. This cutting-edge technology can be used in select coating systems to produce unparalleled epoxy flooring. One of these coating systems in which our clean mica is incorporated is Garage Floor Coating’s new Bagari Stone Effects. This easy-to-clean coating system, not offered by any of the competition, provides a smooth, seamless finish with unique luster and reflective sparkle. Aesthetically stunning and durable, Bagari Stone Effects coating systems provide extreme UV, chemical and abrasion resistance and can be installed in garages, driveways, walkways, patios, kitchens, basements and more. Select from 10 unique and memorable color schemes to inspire you: Arcadia, Bedford, Cambridge, Heritage, Pacific Coast, Stone Ridge, Stonecrest, Trillium, Willow and Windemere. Highly trained in the art and science of application, our installers will ensure your finished epoxy flooring is natural, beautiful and durable…for years to come. GarageFloorCoating.com has been providing the highest quality industrial grade concrete coatings available for 22 years. Our company has an A+ rating with the Better Business Bureau and it is the only epoxy flooring company in Arizona certified as ISO 9001:2015 compliant. For a free estimate and more information, please visit www.garagefloorcoating.com or call 602-579-2628.